How to start an import business in New Zealand? What are the certification formalities to import to New Zealand? How to get the status of an importer in New Zealand? How to get import licence in New Zealand? 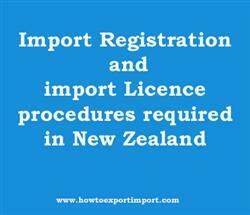 What are the procedures for registration as an importer in New Zealand? This post explains about import registration procedures to be obtained from New Zealand government authority for importation to New Zealand. If you need to import goods or services, a onetime registration procedure is being completed in most of the countries. Such import export licence may be obtained from concerned government department of New Zealand if required. You can engage with import or export goods if you are New Zealand legal entity. You need to register with Ministry for Primary Industries (MPI), for importing certain product such as food products, farming goods etc. The New Zealand Customs Service and the Ministry for Primary Industries (MPI) need to clear business or commercial goods for import and export, and document what’s coming into and going out of the country. The MPI must be fulfilled that it meets import regulations and leads and doesn't represent a biosecurity risk. Register with the Customs for a client code, if you’re importing or exporting goods or products worth more than NZ$1,000, in addition, you needs a supplier code if you’re importing. All suppliers importing into or exporting from New Zealand require a supplier code. If you’re a New Zealand exporter, you need both a client code and a supplier code. Also enroll with Trade Single Window (TSW) system if you’re exporting anything worth more than NZ$1000 (Customs value) which enables registered users to submit lodgements like import and export entries or declarations, view lodgements submitted on your behalf, and apply and manage client and supplier codes. This information is about import licensing procedures to import goods to New Zealand. If you have to add more information about import permit and registration required to import goods to New Zealand, share below your thoughts. Requirements of registration to import to CHRISTCHURCH. Registration requirements in DUNEDIN to import. Registration needed to import to INVERCARGILL. How can I register to import in LYTTELTON. What Licence requited to import in NAPIER . What should I do to import goods in NELSON . How to get import licence in NEW PLYMOUTH. Procedure to get registration to import in PORT CHALMERS. Mandatory process need to complete import in PORT PEGASUS. First permission required to import in TAURANGA. How can I start import business TIMARU?. How to begin import trade in WELLINGTON? Permission to initiate to import in Auckland. The way to get registration to import in Christchurch. Import registration procedures required in AUCKLAND. Import Licence process in BLUFF. Process to import to CAMBRIDGE. How to import to India from Luxembourg? How to export from India to New Zealand?